In Take One, following the conjunction through the four elements over 2,500 years, we see two fire/air peaks: the rise of the Roman Empire, then a thousand years later the rise of European and later American colonial Empires: waves cresting, then sinking. In Take Two, we see a clear innovative technological peak via the rise and fall of the Roman Empire, followed by a slow decline (the 500–1000 CE period had 3 Jupiter/Uranus conjunctions in Aquarius) into the Dark Ages with only one Aquarian conjunction. The 7 Aquarian conjunctions of 1500 – 2000 CE correlate with the rise and dominance of European and American colonialism: with that, the most breathtaking scientific and technological breakthroughs and advances ever known. 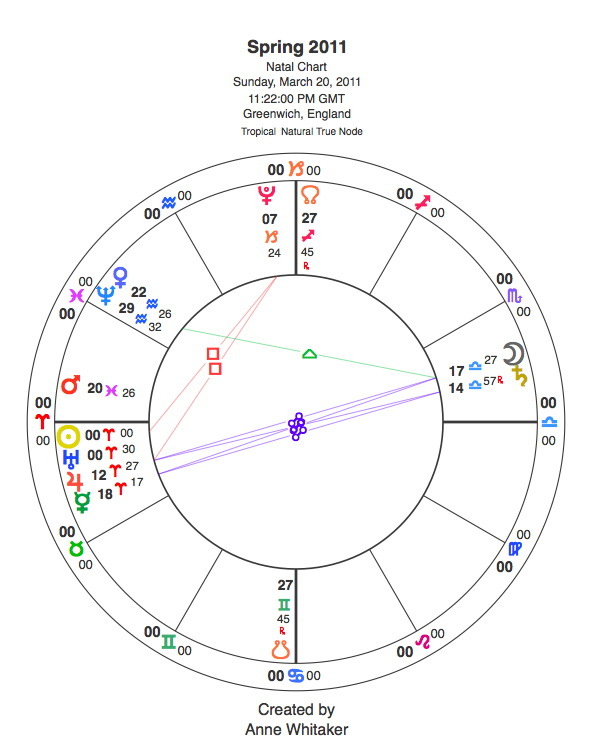 However, if this Aquarian conjunction’s behaviour is an accurate predictor, we have already entered a 500 year period of what looks like pretty sharp decline, with only one conjunction in Aquarius – backed up by the backwards shift of the conjunction generally into earth and water from 2050. This date seems to have cropped up often in recent years across the news media, as a time when amongst other ills, it is estimated that oil will run out if we carry on consuming at an undiminished rate. Take Three, the movement backwards in time from Aries to Pisces, offers a similar picture, with the two Aries periods in two thousand years roughly correlating with the rise of world-dominating Empires. Those symbolic pictures when looked at over long periods of time hold a profound contradiction. If followed “on the face of it” they reveal dynamic forward motion as the Jupiter/Uranus conjunctions in our examples – viewed through fire and air, then through Aquarius, then Pisces and Aries – reveal the ‘growth and awakening of human consciousness’ as they unfold to the pulse beat of their 14 year cycle through the twelve zodiacal signs. The last conjunction was in Aquarius in 1997. This one is in Aries/Pisces in 2010/11. The next one is in Taurus in 2024. The one after that, in Cancer in 2037/8. And so on, forward, forward…. But as we have just seen, the underlying movement in deeper time, as the conjunctions retrograde from 29 degrees to 0 degrees of the signs under examination, is backwards. What could this mean? By the time Jupiter-Uranus conjunctions return to occur only in earth and water, roughly from 2050 to 2400 or so, we may have to use our exploratory and innovatory energies in the service not of “progress” as was the case from 1500–1850, but of survival. We may by then be a species on a planet seriously damaged by the shadow side of the Jupiter/Uranus combination: arrogant pursuit of exploration and innovation regardless of the physical, emotional and spiritual cost. On the other hand, taking a more upbeat view, the conjunction’s move back through earth and water may bring a paradigm shift involving reinterpretation of what it actually means to be human, resulting from changes wrought by the revolution which is already taking place in genetic modification and cloning. Perhaps we will see the beginnings of the evolution of a new humanoid species where micro-technology implants into the human body, and genetic tailoring, will vastly extend the range of which we are capable? This entry was posted in Astrology Article Archive 4 – Spring Equinox 2011 and the Big Picture and tagged "as above so below", Anne Whitaker, “Jupiter Meets Uranus”, Dark Ages in Europe, Jupiter/Uranus conjunction 2010/11, Jupiter/Uranus conjunctions in Aries and Pisces, Jupiter/Uranus in Aries, Michelsen’s “Tables of Planetary Phenomena”, mundane astrology, Spring Equinox 2011, The Aries point, The Big Picture, the Black Death, the cycle of life, the Quantum Vacuum, the Roman Empire, the Void. Bookmark the permalink. THANK YOU ONCE AGAIN…………..THAT IS ALL I NEED TO SAY! Hi Joan – greetings and thanks again for your support.